It's Mario's popular younger brother Luigi! Limited availability Super Mario Bros. plush doll. Soft and squishy, Luigi looks just like he should! 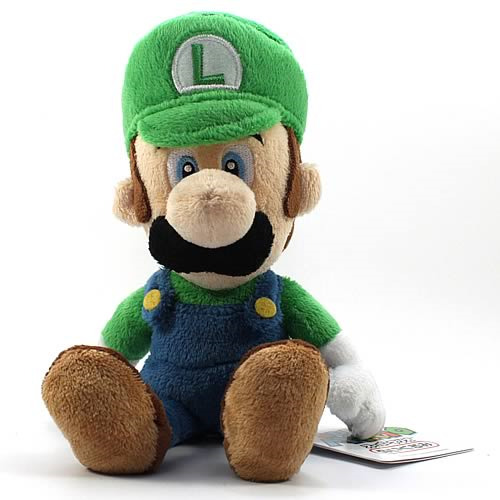 Mario's popular younger brother Luigi is the star in this official Super Mario Bros. plush doll. Soft and squishy, Luigi stands approximately 9-inches tall and looks just like he should! Limited availability. Luigi is Mario's younger, taller twin brother. Luigi has assisted and fought alongside his brother on many occasions. Throughout his life, he's lived in Mario's shadow, developing both cowardly and heroic tendencies. Mario Bros. marks his first appearance in a Super Mario arcade game. Originally a color swap of Mario, Luigi was created to facilitate a second player option. Since the two-player mode was dropped from most Super Mario games beginning with Super Mario Land, Luigi gained his own identity and personality.